The other seeds were bought from Semillas and PepperSeeds.eu. The Seeds from China have yet to arrive so this experiment it more likely in the ice for now. I started now instead of January because I didn't have the budget for grow lights. 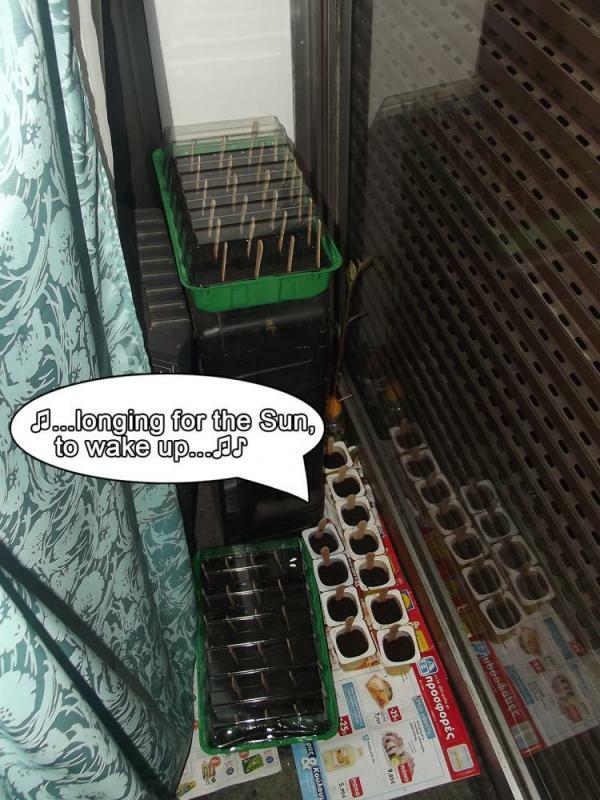 I might be getting a few more seeds though (I am an idiot and forgot to get Tabasco the last time...). If anyone has White Thai I will be interested. Planting trays from Lidl. They work well. Small cups are from pudding; also from Lidl. 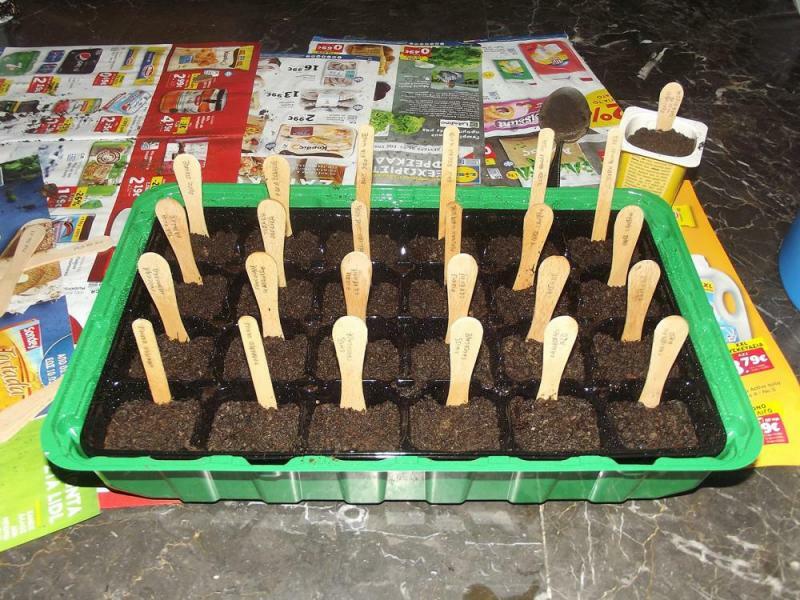 I know that my writing is bad and writing with a pencil on Beech Wood sticks made it worst, but I didn't want to risk adding unnecessary chemicals to the soil. Here the boys are having a look at the AB offers flyer while longing for the Sun to wake up. They might not need sunlight but they do need the heat. And the wait begins! What's the list of peppers you're growing this season? And I will get some more. I have to buy some seeds for a gift, so I can justify the expense of Shiping & Handling and buy some more. 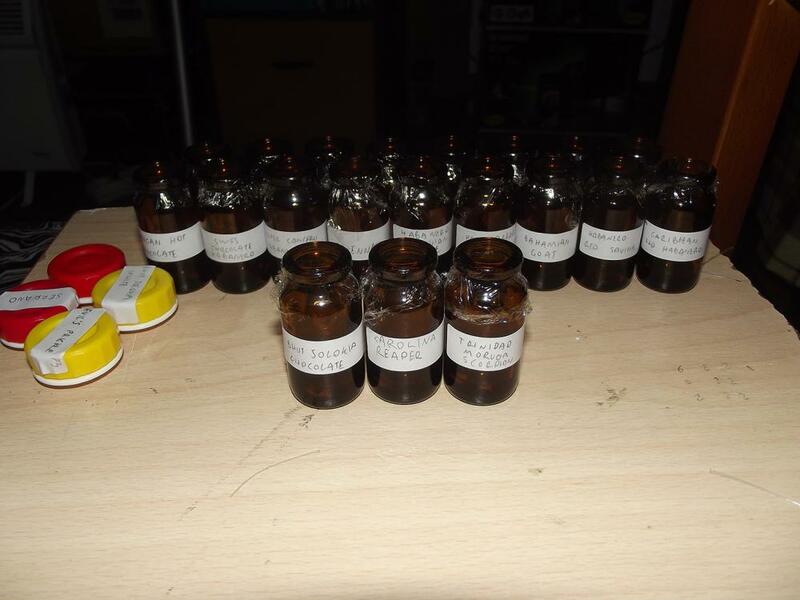 Anyone knows a reputable source for White Thai and Naga Viper in Europe? I would love to grow them. Edited by Ares Schizas, 11 March 2018 - 09:51 PM. 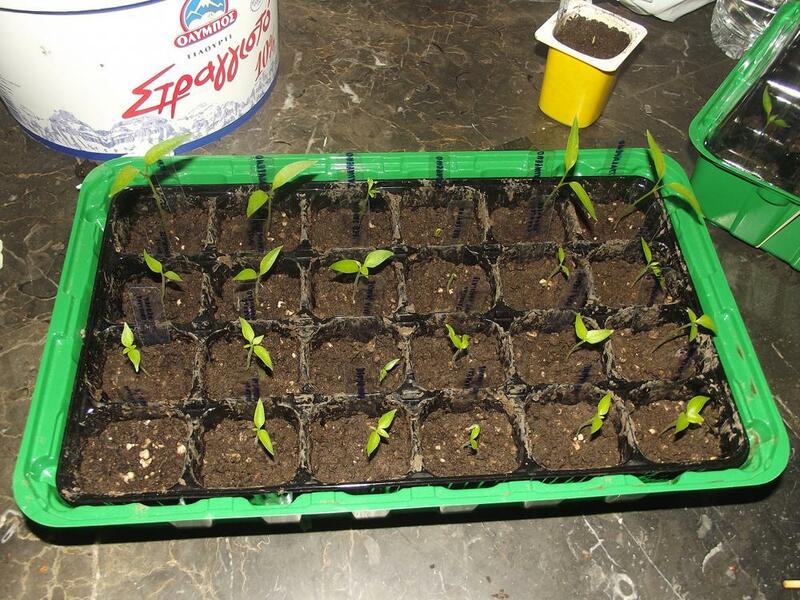 The first plant on the list.... the Jalapeno... well that the little pepper for me !! I also have the Red Savina growing in the tent. Other than the Bhut's I've never tried the other peppers on your list. off to a good start, I highly recommend adding the El Scorponero Orange to the grow list. You won't regret it. Very good cross. Still some variability in it. That's a lot of pudding to eat! Edited by D3monic, 11 March 2018 - 09:07 PM. This was copy-paste of the list that I sent to friends when I asked them if they wanted me to plant seeds for them. I had intentionally omitted El Scorponero and Devil's Prickle because it didn't fell right to share seeds without permission. Then I forgot to add them in the lest. It is fixed now. 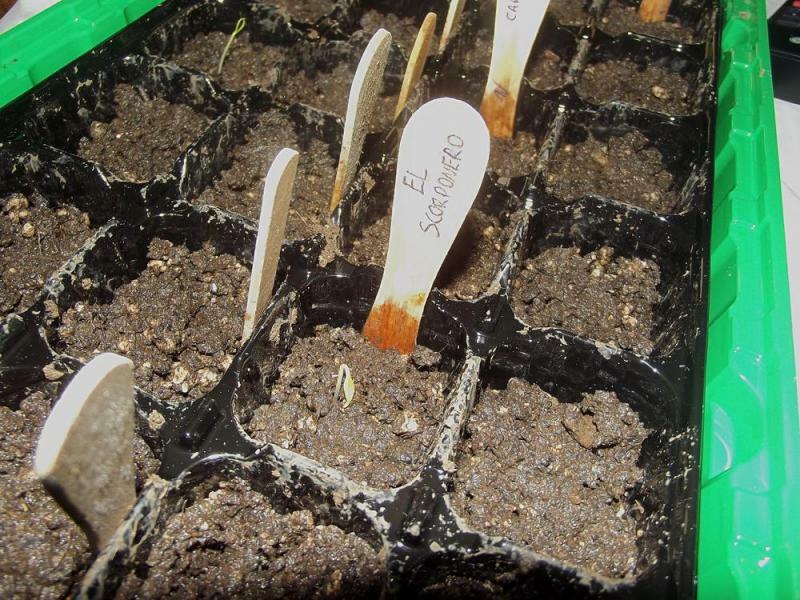 You can see in the picture of the six pots that el Scorponero has been planted. 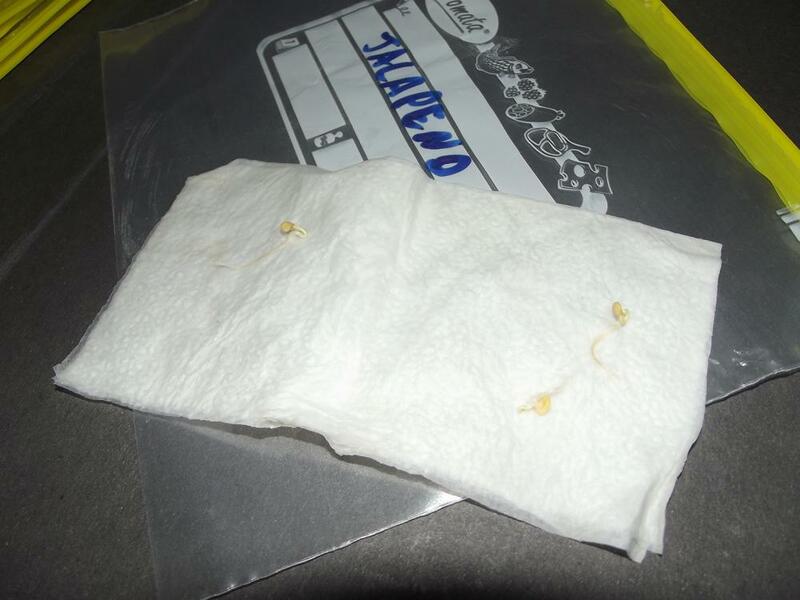 I also grow some back-up seeds in paper towel, they started germinating already! oh duh, I didn't even see it there. Look forward to seeing how they turn out for you. Edited by D3monic, 11 March 2018 - 10:10 PM. I am not going to keep all the plants. One or two from each cultivar is enough. The others I will gift to friends and family. Still, that will be a lot of pepper, but I have just enough space as long as I don't use anything more than 15-20Ltr pots. Thankfully, my parents are chiliheads and love plants, so I get away with it. Not a surprise. I too can't see it and is my own handwriting. When I was in school I never bothered to develop a nice handwriting because I thought that soon most communication will be done by using computers. Thank you! Can't wait to taste the El Scorponero! 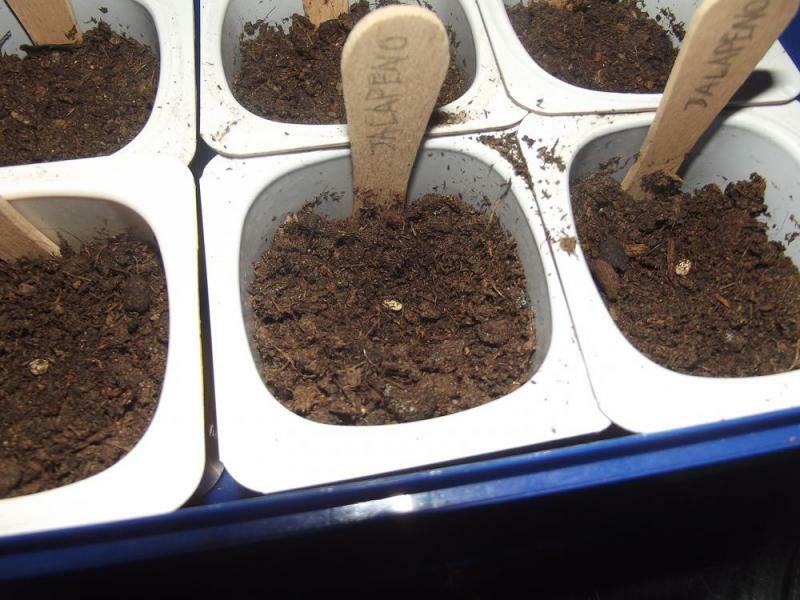 The first paper-towel-germinated seeds are starting to come along! If you are like me, I would suggest going with the paper towel method. 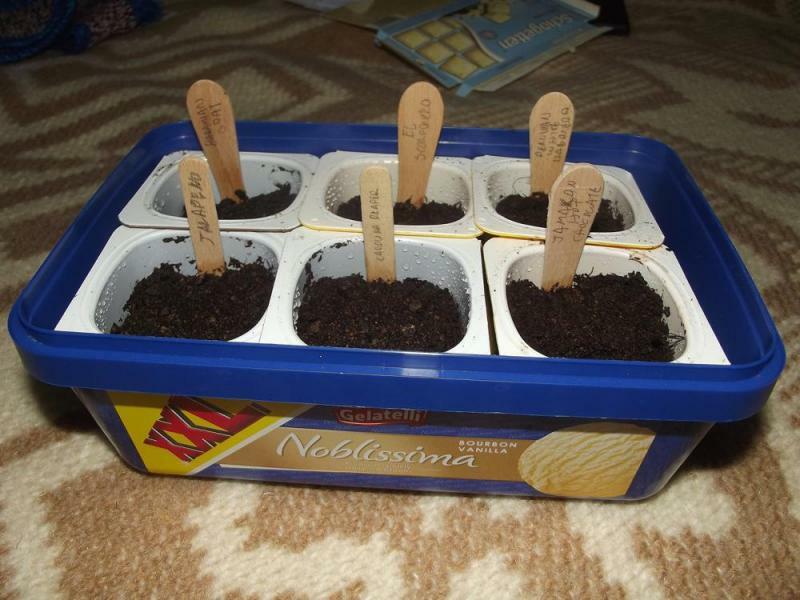 This way you can see what your seeds are doing. Save me a reaper pop would ya? I will save you three. It is amazing how well the wet paper towel method works. Just yesterday, there were no cotyledons and people suggested to put them in the soil before they appear. But the seeds had other plans. Less than 24 hours later, the cotyledons were out and the helmets were shed. 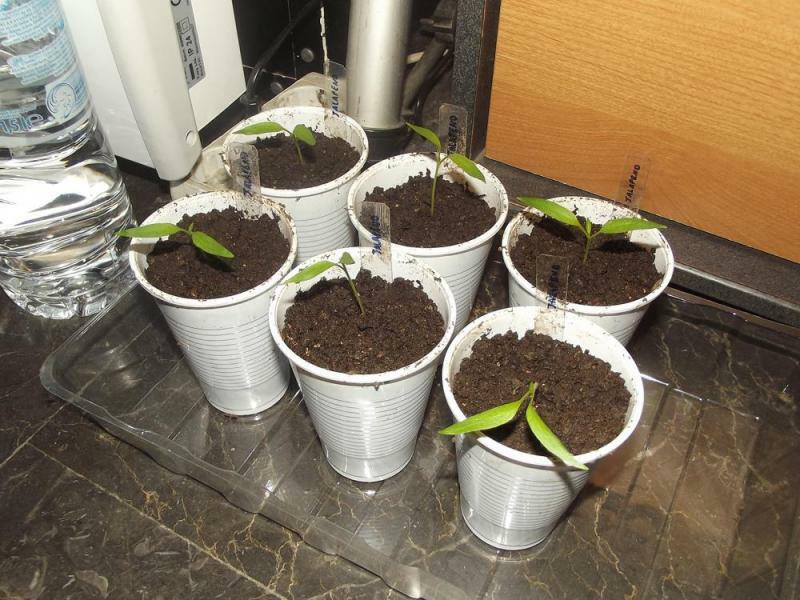 I planted these six Jalapeno seeds, from the same batch, at the 4th of March. Ten days later there were no signs of grows. Compare that to the paper-towel above and it is not hard to smell the problem. So I exhumed the seeds for further investigation. 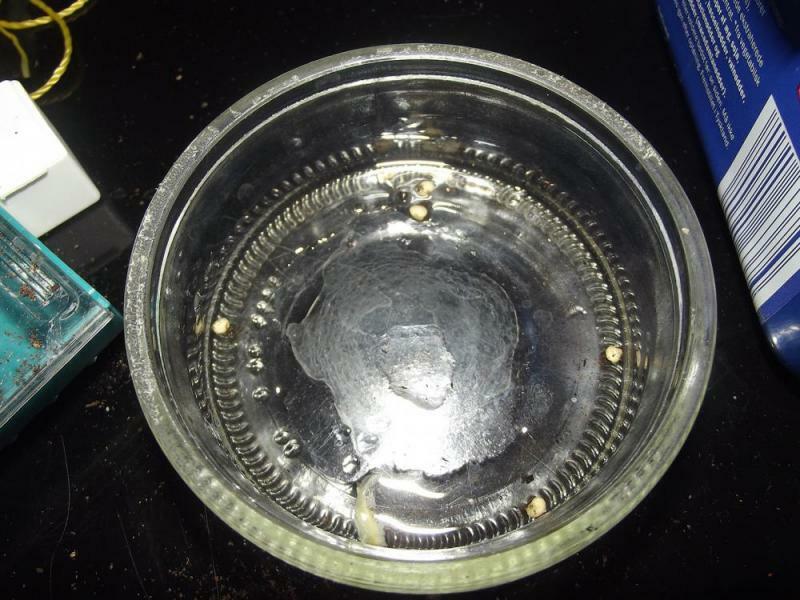 The seeds were recovered and not surprisingly, they were dry as something really dry. So I picked them out and put them in a wet paper towel. Apparently, I did many newbie newbity noob mistakes. My soil was not moist enough. My first seeds were soaked in, apparently, too strong tea solution. I used a sprayer to water them, but the water was not enough. I did not cover the pots to create a humid environment. So I ended up losing many seeds. And I mean actually losing them, recovering some of them was not possible. They just disappeared as if the exploded, then imploded and exploded again. Anyway, I exhumed half of them. The vast majority did not had the slightest sign of a root. Those who has roots were re-poted. Those who did not were put in wet paper towels and in ziplock bags or inside small containers with wet paper towel pieces underneath. I might go and exhume all the seeds. Not a problem though. 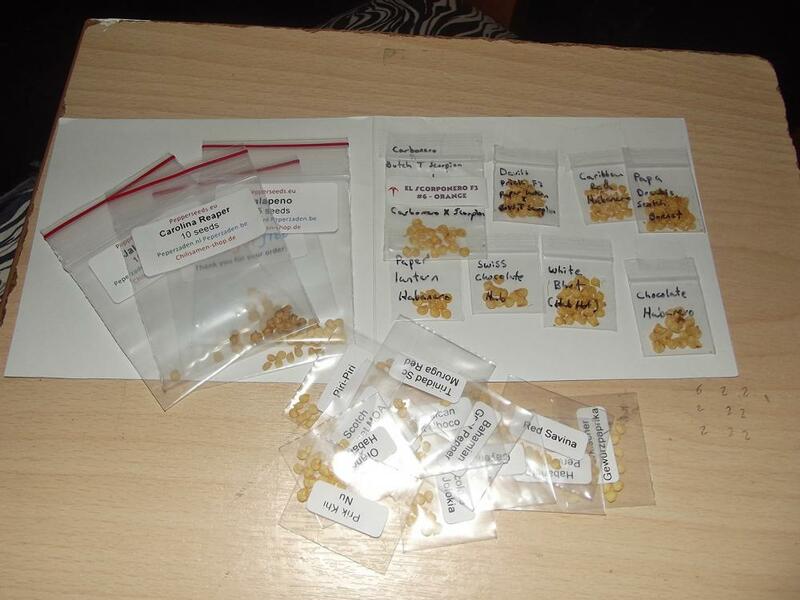 I ordered a few more seeds and I have some seeds left, so I will be able to compensate. I am mostly concerned about the Reaper though. From the back-up paper towel seeds, one had a black spot and it is pretty much dead, the other seems to be rotting ("Rotting Reaper" sounds like a good name for a metal band) and only one has broken out of its shell. I have recovered one Reaper and it now rests in a wet paper towel. There are two more in the second tray that I have not exhumed. I learned from my American friends to "Never Put All Money In The Same Boot". That is a very good advise. Always have a back-up. And a secondary back-up. And a tertiary back-up. And, why not, a quaternary back-up. 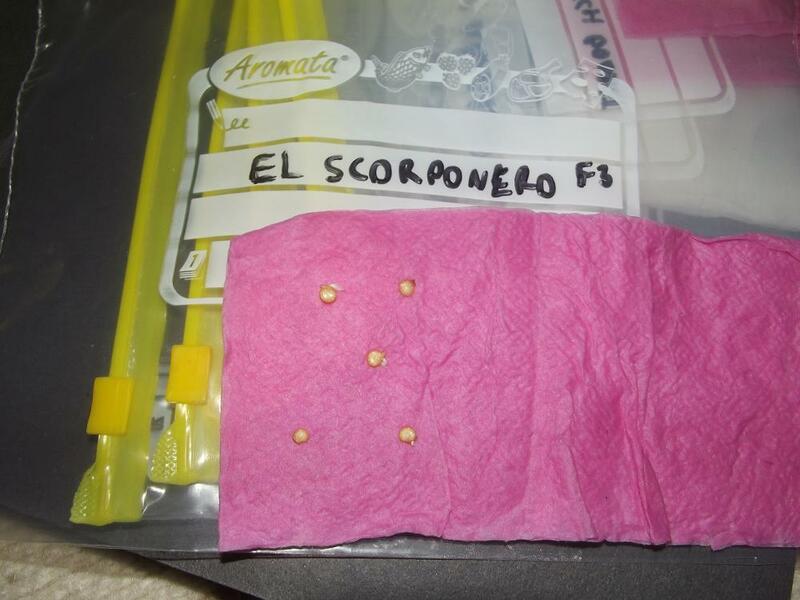 The El Scorponero is rising. 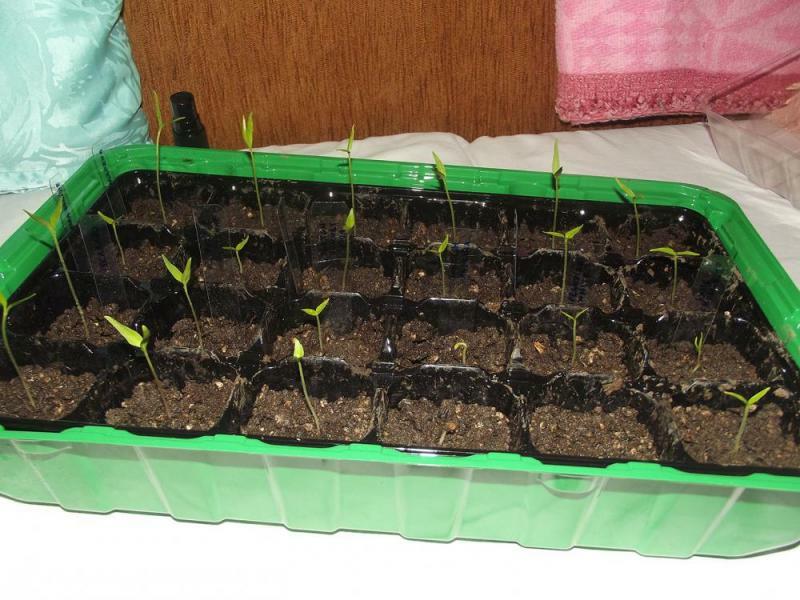 I noticed that many of my peppers, especially Jalapenos, have (at least for me) a tendency to grow leggy. It is self-evident that these seedlings cannot handle winds. For now, they are in their protected propagators, but soon the covers will have to be removed because they grew too large. I read that one way to fix this problem is to transplant them and cover the steams with soil until the excess is length is covered. Also, from what I read, some pruning may not be a bad idea. Put more light on the leggy plants. Wind doesn't make a plant leggy unless the wind is strong enough to blow away the light . You can't prune those seedlings. There is nothing to prune. Maybe I misinterpreted what you meant. You can bury the stems after a transplant but from what I see in the pictures, I wouldn't worry about it too much at this point. If you keep a breeze blowing on the plants they will get stronger... if given more light. Thank you for the advice! They are outside now; their second day on the wild has just begun as I write these lines. They had sunlight when they were inside but I could use a light for the night; anyway, I had no budget for that sort of stuff. I meant to prune them at a later stage. Some people don't prune, others do prune, so pruning them might help them? Maybe prune them twice? I don't know. The frosts start in November. My concern is that a strong wind might break them if I remove the covers. I think you are on the right track. Depending how they do, how leggy they are once they have, say 8 true leaves, you can look at pruning (or topping, as in removing just the top of the plant). It's what I do and it works very well. I repotted the leggy Jalapenos covering about 3/4ths of the excess stalks. It is ridiculous how leggy they got. Also, their roots seem to be underdeveloped. I guess direct Sunlight will help? I am going to check them when the night falls. 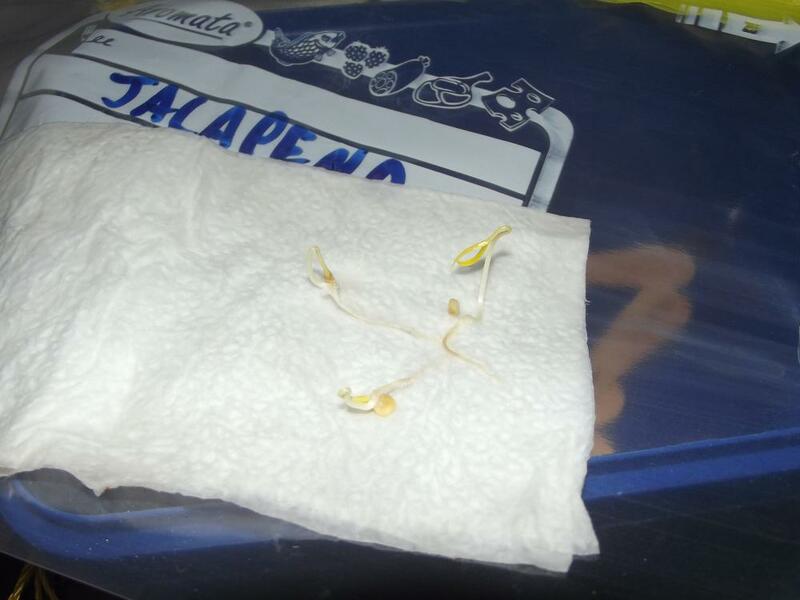 If you take your Jalapenos from an indoor grow light and force them into "full sunlight", they can be damaged from "sunburn". The sun can be much more intense than indoor grow lights so you should follow a "hardening off" procedure. Plus, the change in temperature/humidity from the grow room to the outdoors can be significant... so look up "hardening off". As for the roots, what I say is "Life will find a way" ! (that was from Jurassic Park...Jeff Goldbloom). You can have a pretty crappy start to plants and they will find a way to survive as long as they have the correct environment to survive. Water, Nutes and Sunlight. I never prune my plants (personal choice) unless I am growing indoors and the plants get too big for the tent that I am growing them in. Let them grow however you like. If your shooting for maximal yield then maybe you could play around with pruning. Too much trouble for me. I just want peppers ! !